The Center is happy to announce a new exercise program Cardio-Drumming with Heather. This class will integrate music and movement to create a fun-filled exercise program. The "Drums" used in the class are large exercise balls and a round tub used as the base along with drum sticks. Drum materials can be purchased at Five Below and drum sticks at Guitar Center. So grab your drums and join the latest exercise craze! Call the office for information on upcoming sessions. Lifetime Fitness is an educational and exercise experience. Participants learn about their bodies, how they work, and the importance of daily movement. The focus of Lifetime Fitness is on personal independence. It is based on the premise that the body is meant to move, but the movement need not be fast or hard to provide deep benefits. Cost is $30 for a 10-week session. For more information Contact the center. Come join the best line dancing class around. Great way to get exercise and have fun. Only $3.00 per class. Classes are offered on Mondays from 12:00-1:30 PM. Come join Norma on Monday and Thursday evenings at 6:30pm for a great class. Cost is $5.00 per class. 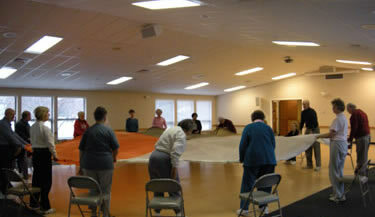 Norma offers a beginner's line dancing class on Thursdays at 1:45pm. Cost is $3.00 per class. Join Kimberly for an hour of fun and fitness Fridays @ 1:00pm. Cost is $5.00 per class or you can purchase a 5 class punch card for only $20! Join our volunteer led balance class. Participants in this class will work through semi-strenuous exercises to improve their balance. This class is not for individuals with mobility issues. Class meets every Monday at 10:45am. Inquire today to determine if your health insurance covers our Yoga class under Silver Sneakers. If you can breathe, you can do some form of yoga. For those who can't get on a traditional mat, chair yoga can offer wonderful health benefits. The physical benefits of yoga include: Greater Flexibility, More Strength and Better Muscle Tone, Improved Breathing, Healthier Blood Pressure & Heart Activity, Increased Energy Level, Improved Balance, Increased Circulation, Reduced Stress, Improved Mental Clarity. Join Cheri on Mondays at 8:30am or Thursdays and Fridays at 9:00am. If your insurance covers Silver Sneakers there is no charge, if your insurance does not cover Silver Sneakers there is a $3.00 drop-in fee per class. No experience required!! Come join our fun group on Mondays at 3:45pm and Thursdays at 11:30am!! Join our table tennis group on Tuesdays from 11:30am-3:00pm or on Thursdays from 3:30pm-5:30pm. This class is perfect for the beginner yoga student. Basic postures are taught in a clear and concise manner with modifications being offered to meet your physical ability. With consistent practice, this class will increase your flexibility, endurance, strength and balance. Please bring a yoga mat and blanket to class. Dress in comfortable clothing that allows for movement. Appropriate for all levels but must be able to get up and down from the floor. Classes will be held on Fridays at 10:30am. A 6-week session will begin Friday, January 4, 2019. Cost is $47 for the 6-week session.